Topics of interest include, but are not limited to: 1. Information Technology Law - Electronic privacy and civil liberties; Intellectual Property; Internet regulation; 2. 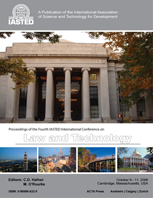 Legal Informatics/Artificial Intelligence and Law - Legal resources on the Internet; Online dispute resolution; Software implementation of legislation and regulations; Legal document processing; Judicial decision support systems; Negotiation and argumentation models and systems; 3. Interdisciplinary Topics - Information security/computer crime; Content-based filters for restricting Web site access; Technology-enabled identity verification; Digital Rights Management: Frameworks and Implementation; Health care information systems; Electronic commerce.